From 1Department of Pharmacy, College of Pharmacy, Ziauddin college of Pharmacy, Ziauddin University, Karachi, Pakistan; 2Department of Chemistry University of Karachi, Pakistan. Address correspondence and reprints request to: Ms. Rabia Bushra, Department of Pharmacy, College of Pharmacy, Ziauddin college of Pharmacy, Ziauddin University, Karachi, Pakistan. The effect of drug on a person may be different than expected because that drug interacts with another drug the person is taking (drug-drug interaction), food, beverages, dietary supplements the person is consuming (drug-nutrient/food interaction) or another disease the person has (drug-disease interaction). A drug interaction is a situation in which a substance affects the activity of a drug, i.e. the effects are increased or decreased, or they produce a new effect that neither produces on its own. These interactions may occur out of accidental misuse or due to lack of knowledge about the active ingredients involved in the relevant substances. Regarding food-drug interactions physicians and pharmacists recognize that some foods and drugs, when taken simultaneously, can alter the body's ability to utilize a particular food or drug, or cause serious side effects. Clinically significant drug interactions, which pose potential harm to the patient, may result from changes in pharmaceutical, pharmacokinetic, or pharmacodynamic properties. Some may be taken advantage of, to the benefit of patients, but more commonly drug interactions result in adverse drug events. Therefore it is advisable for patients to follow the physician and doctors instructions to obtain maximum benefits with least fooddrug interactions. The literature survey was conducted by extracting data from different review and original articles on general or specific drug interactions with food. This review gives information about various interactions between different foods and drugs and will help physicians and pharmacists prescribe drugs cautiously with only suitable food supplement to get maximum benefit for the patient. From the 1Department of Orthopedics, Shaheed Sadoughi hospital, Yazd, Iran; 2Medical Student, Shaheed Sadoughi medical university, Yazd, Iran; 3Department of Biostatic and Epidemiology, Shaheed Sadoughi Medical University, Yazd, Iran; 4Radiology Department, Shaheed Sadoughi hospital, Yazd, Iran. Address correspondence and reprints request to: Zahra Behnamfar, Shaheed Sadoughi medical university, Yazd, Iran. Objectives: De Quervain disease is a mechanical tenosynovitis due to inadequacy volume between abductor pollicis longus, extensor pollicis brevis and their tunnel. Treatment methods include immobilization, steroid injections, and operation. For the first time Fritz De Quervain described surgical treatment of this disease. Since then, various ways of treatment have been reported. The purpose of this study is to compare the clinical outcomes of a longitudinal incision with a transverse incision in De Quervain disease. Methods: This was a randomized controlled clinical trial conducted in three hospitals in Iran, Yazd from March 2003 to September 2008. One hundred-twenty patients with De Quervain disease who did not respond to conservative treatment were operated with two different incisions. The patients were followed for three months to compare the surgical outcomes. Results: During a three month follow-up, a significant difference was shown between the two methods (p=0.03). Results of surgical treatment with longitudinal incision were excellent (only 5 hypertrophic scars), but there were 13 postoperative complaints with transverse incision. Conclusion: According to our findings, longitudinal incision in surgical treatment of De Quervain disease is better than transverse incision. From the Department of Obstetrics and Gynecology, Nizwa Hospital, Nizwa, Sultanate of Oman. Address correspondence and reprints request to: Dr. Hansa Dhar, Department of Obstetrics and Gynecology, Nizwa Hospital, Nizwa, Sultanate of Oman. Objectives: Ectopic pregnancy occurs when the embryo fails to implant within the uterine cavity. Methotrexate, a folic acid antagonist has been widely used to treat ectopic pregnancy. The aim of this study is to determine the efficacy of methotrexate treatment for ectopic pregnancies in our settings which will in-turn help us reduce maternal mortality and morbidity. 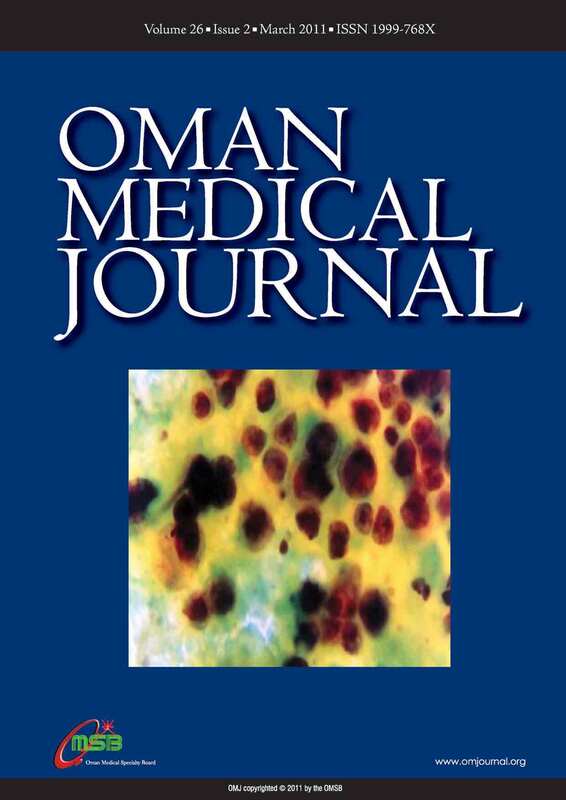 Methods: This was a retrospective review of 60 cases of ectopic pregnancy treated with single dose methotrexate in Nizwa hospital, Oman. Demographic data, clinical presentation, treatment progress, outcome, side effects and future fertility follow up were analysed using a computer database. Selection criteria included hemodynamically stable women with ß-hcg level of ≤5000 mIU/ml, adnexal mass ≤4 cm, absent cardiac activity and hemoperitoneum less than 100 ml. Human chorionic gonadotrophin (hcg) assay and clinical presentation were used to determine cases which warranted surgical intervention. Results: The success rate of single dose methotrexate therapy in our study was 65% (n=39) and 35% (n=21) required surgical intervention compared to reported success rate of 67-100% published in various studies. Careful selection of cases and confining strictly to the criteria improved the success rate from 40% to 60% in five and half years of the study. The mean average time of resolution of ectopic pregnancy was 32 days for a single dose and 58 days for repeat second or third doses. Eight cases of pregnancy of unknown location were treated successfully with Methotrexate. No major side effects were noted. A successful fertility outcome of 30% in the first year followed by 13.3% in the subsequent second year with a secondary infertility rate of 11.6% was observed in this study. Conclusion: Methotrexate treatment of ectopic pregnancies is safe and effective with no major side effects. Intramuscular methotrexate has the advantage of tubal conservation and saves patients from requiring surgery. It is easier to administer than intraoperative route, which is by laparoscopy and needs expertise. Our study showed single dose methotrexate to be an effective treatment option for selected patients with unruptured tubal ectopic pregnancy. From the Department of Histopathology and Cytology, Faculty of Medical Laboratory Science, University of Khartoum, Khartoum, Sudan. Address correspondence and reprints request to: Dr. Hussain Gadelkarim Ahmed, Department of Histopathology and Cytology, Faculty of Medical Laboratory, Science, University of Khartoum, Khartoum, Sudan. Objectives: This study estimated the merit of employment of Grading Fine Needle Aspiration Cytology (GFNAC) in the assessment of breast lumps, compared to conventional Conventional Fine Needle Aspiration Cytology (CFNAC). Methods: Seventy-five women with breast lumps were referred to the surgical unit at Khartoum Teaching Hospital. Fine Needle Aspiration (FNA) materials were obtained for cytology and biopsies from the same patients for histopathology. Cytological materials were assessed using two diagnostic systems (GFNAC and CFNAC) without prior knowledge of the histopathologic diagnosis. Results: Of the 75 patients studied, 40 (53.3%) were diagnosed as having breast cancer by Histopathology and the remaining 35 (46.7%) were diagnosed with benign lesions. Of the 40 positive cases, 35 (87.5%) and 28 (70%) were found positive by CFNAC and GFNAC respectively. Of the 35 negative cases, 33 (94.3%) and 35(100%) were found negative by CFAC and GFAC correspondingly. Conclusion: The obtained Specificity of 94.3% and 100% in addition to sensitivity of 87.5%, 70% were credited for CFNAC and GFNAC systems respectively. Therefore, it is recommended to merge GFNAC as a supplementary to CFNAC for the diagnosis of breast cancer. From the 1Department of Pharmacology, H. S. K. College of Pharmacy, Bagalkot, Karnataka, India; 2Oman Medical College, Baushar Campus Azaiba, Muscat, Sultanate of Oman; 3Institute of Pharmacy, Bundelkhand University, Jhansi, India; 4Ambedkar Centre for Biomedical Research, Delhi University New Delhi, India. Address correspondence and reprints request to: Dr. Havagiray R Chitme, Oman Medical College, Baushar Campus, Azaiba, Muscat, Sultanate of Oman. Objectives: To evaluate the hypoglycemic and anti-diabetic activity of chloroform extract of Calotropis gigantea leaves and flowers in normal rats and streptozotocin induced diabetes. Methods: The hypoglycemic activity in normal rats was carried out by treatment using chloroform extract of Calotropis gigantea leaf and flower 10, 20 and 50 mg/kg, orally. The oral glucose tolerance test was carried out by administering glucose (2 g/kg, p.o), to non-diabetic rats treated with leaf and flowers extracts at oral doses 10, 20 and 50 mg/kg, p.o and glibenclamide 10 mg/kg. The serum glucose was then measured at 0, 1.5, 3 and 5 hr after administration of extracts/drug. Streptozotocin-induced diabetic rats were administered the same doses of leaf and flower extracts, and standard drugs glibenclamide was given to the normal rats or 0.5 ml of 5% Tween-80, for 27 days. The blood sample from all groups collected by retro-orbital puncture on 7, 14, 21 and 27th days after administration of the extracts/drug and used for the estimation of serum glucose levels using the glucose kit. Results: The Calotropis gigantea leaves and flowers extracts were effective in lowering serum glucose levels in normal rats. Improvement in oral glucose tolerance was also registered by treatment with Calotropis gigantean. The administration of leaf and flower extracts to streptozotocin-induced diabetic rats showed a significant reduction in serum glucose levels. Conclusion: It is concluded that chloroform extracts of Calotropis gigantea leaves and flowers have significant anti-diabetic activity. From the Department of Biology, Arnoos Square, Damascus, Syria. Objectives: The purpose of this study is to further confirm the results documented in previous studies and to test the hypothesis of the presence of any correlation and if found, the regression nature of such correlation between triglyceride and glucose levels in one hand and cholesterol and glucose levels in the other hand. Methods: Samples were collected between March and August 2009 from 438 of both males and females from two patient groups; a) nondiabetic patients, b) non-insulin dependent type II diabetic patients. The patients’ serum glucose; cholesterol and triglyceride were simultaneously determined. A comparison study was conducted on the effect of the elevated level of each of the parameters (Cholesterol and Triglyceride) on glucose elevation. Results: The results showed that there was a significant difference in the number of cases with high glucose values >110 mg/dl among the three different study groups. There was a significant difference in the number of cases with glucose values >110 mg/dl between the two different study groups; 1) triglyceride <151 mg/ dl and cholesterol >201 mg/dl, 2) triglyceride >151 mg/dl and cholesterol>201 mg/dl. Conclusion: The elevation in triglyceride but not cholesterol has the same effect of both triglyceride and cholesterol elevation together on the association with increasing levels of high glucose in blood. From the 1Department of Pediatrics, University of Ilorin Teaching Hospital, Bida, Niger State; Solomon Amos, BF Rotimi; 2Department of Pediatrics, Federal Medical Centre, Ilorin, Kwara State. Address correspondence and reprints request to: Dr. Muhammed Adeboye, Department of Pediatrics, University of Ilorin Teaching Hospital, Bida, Niger State. Objectives: Measles is a highly infectious immunizable disease with potential for eradication but is still responsible for high mortality among children, particularly in developing nations like Nigeria. This study aims to determine the hospital based prevalence of measles, describe the vaccination status of children managed for measles at the Federal Medical Centre, Bida, Niger state and to identify the parental disposition to measles vaccination. Methods: This is a cross-sectional study carried out over a period of 18 months beginning from July 2007. All children with a diagnosis of measles made clinically and reinforced with serological test in the WHO Measles, Rubella and Yellow Fever laboratory in Maitama District Hospital, Abuja were recruited. Informed consent was obtained from the parents/care givers. Structured questionnaire was used to obtain information and data analysis was by SPSS version 15. Results: One hundred and nine children were managed for measles, constituting 8% of total admission over the study period. The male to female ratio was 1.2:1. Of the 109 children with measles, 90 (82%) did not receive measles vaccination. Eighty-eight (80%) of the parents or guardian felt vaccination was bad for various reasons. Of the 23 (21.1%) children whose parents or guardians were positively disposed to vaccination, one death was recorded while the remaining seven deaths were recorded among children whose parents were negatively disposed to vaccination. All the deaths were in the non-vaccinated group below 2 years of age. Conclusion: Measles is still a major health burden in our community. The majority of affected children were not vaccinated due to negative parental disposition. Continuous health education is required for change the disposition of the parents/guardian and improve vaccination coverage to minimize measles associated morbidity and mortality. From the 1Department of Research Center of Molecular Biology, Baqyiatallah University of Medical Sciences Tehran, Iran; 2Department of Research Center of Chemical Injuries, Baqyiatallah University of Medical Sciences Tehran, Iran. Address correspondence and reprints request to: Dr. Ali Karami, Department of Research Center of Molecular Biology, Baqyiatallah University of Medical Sciences Tehran, Iran. Objectives: To determine the levels of vascular endothelial growth factor isoform consisting of 165 amino acids (VEGF165) in Bronchoalveolar Lavage Fluid from Mustard Exposed Patients. Methods: Bronchoscopy with Bronchoalveolar Lavage was performed on sulphur mustard exposed patients. A total of 39 patients with documented exposure to Sulfur Mustard during the Iran-Iraq war participated in this study, of which 38 patients were males and one patient was female. Results: The mean±SD age of patients was 41 ± 6.6 years. The mean time after exposure to sulfur mustard was 19 ±1.7 years. Eighteen patients had concomitant war injuries but they were not related to the respiratory system. While Twenty-two patients had a history of submassive persistent hemoptysis. There was no case with massive hemoptysis. Most of the patients had small airway obstruction (FEV1/FVC% = 78.14 ± 9.76 and FEV1% =82.79±18.23). Twenty-three patients had significant air trapping in the chest. High Resolution Computed Tomography was compatible with BOS. VEGF165 concentrations in BALF were 36.87 ± 34.68 pg/ml. When corrected to total protein of Bronchoalveolar Lavage Fluid (BALF) it was 0.76 ± 0.70 pg/mg. BALF of VEGF did not correlate with hemoptysis or air trapping in chest HRCT. Thus, there was also no correlation between level of VEGF165 in BALF and any of PFT indexes (FVC, FEV1, MMEF or PEF). Conclusions: Although VEGF is one of the cytokines which has an important role in chronic pulmonary disorders, it seems that it has no essential role in the severity of Mustard Lung Disease. From the Department of Pediatric Surgery Hamad General Hospital, Doha, Qatar. Address correspondence and reprints request to: Dr. Tariq O. Abbas Department of Pediatric Surgery Hamad General Hospital, Doha, Qatar. Bezoars are concretions of swallowed hair, fruit vegetable fibers, and similar substances found in the alimentary canal. The first description of a postmortem human bezoar was by Swain in 1854. Although the prevalence of bezoars in humans is low, an absence of treatment has been associated with mortality rates as high as 30%, primarily because of gastrointestinal bleeding, destruction, or perforation. From the 1Department of Endocrinology Sheri Kashmir Institute of Medical Sciences, Srinagar J&K, India; 2Department of Neurology. Sheri Kashmir Institute of Medical Sciences, Srinagar J&K, India. Address correspondence and reprints request to: Dr. Mohammed Ashraf Ganie, Department of Endocrinology Sheri Kashmir Institute of Medical Sciences, Srinagar J&K, India. Persistent hiccup is a rare but potentially severe condition that can be symptomatic of a variety of diseases or idiopathic. Most episodes last only a few minutes and are self-limited, but hiccup can get persistent and become a real problem for physician and patient alike. The center of hiccup may be activated by a great variety of stimuli travelling along different nerve pathways and bring different effecter responses. We report a case of persistent hiccup as a presentation of impending thyroid storm of Graves’ disease. Though the condition is rare, clinicians should remain alert to the possibility of this diagnosis.